Scholastic and Weston Woods Studios have co-produced hundreds of lightly animated and live-action short features based on popular kids' books during the last few decades, and chances are good that your children have seen one or more at school, home, or online at some point. From well-known classics like Curious George (not the PBS series), Where the Wild Things Are, and Corduroy to Frank Asch's Moonbear adventures and almost everything in between, they've released countless VHS tapes and DVDs with something for just about everyone. At least two Storybook Treasury collections have been released as well, each with 100 shorts in one handy box; smaller sets like this one are good too, with the only trade-off being a few repeats between collections. Either way, their single-disc DVD volumes are by far the most common, often serving up a half-dozen or so shorts for $10-$15. Me...Jane, one of their latest DVD collections, includes four like-minded "girl power" stories that pay tribute to well-known and obscure female pioneers throughout history. 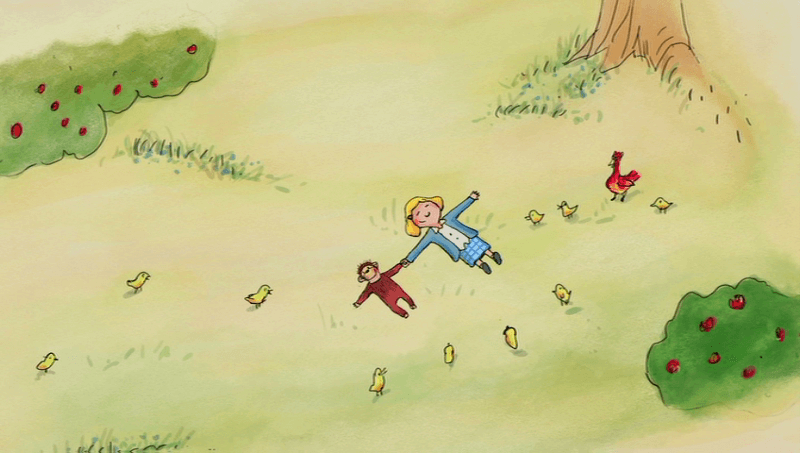 The self-titled main feature is a charming account of Jane Goodall's childhood based on the 2011 book by Goodall and cartoonist Patrick McDonnell (Mutts). Who Says Women Can't Be Doctors? tells the story of Elizabeth Blackwell and her quest to become to become America's first female doctor. I Could Do That! : Esther Morris Gets Women the Vote (also included on the 100 Storybook Classics, Volume 2 collection) details her efforts to become America's first female justice of the peace. Finally, Players in Pigtails is the odd woman out and tells the legend of Katie Casey, fictional member of the very real All American Girls Professional Baseball League (and subject of the original 1908 version of "Take Me Out to the Ball Game"). As with most Scholastic DVDs, the animation quality is mixed. There's little to no movement in most of these images (Me...Jane is the exception, with solid work by Paul and Sandra Fierlinger); more often than not, there's just slow pans across the book illustrations. While the added narration (by Katherine Kellgren, Jorjeana Maria, Joan Allen, and Zooey Deschanel, respectively), music, and sound effects are appreciated, kids will probably get just as much out of reading the original books. But the real bummer is a lack of content: each of these shorts barely cracks the ten-minute mark, which means you'll go through this disc in less than an hour. It's decent enough material, especially compared to most mainstream kids' entertainment, but paltry collections like this just don't cut it anymore. This is another mixed-bag collection from a visual standpoint: the main feature is presented in 1.78:1 anamorphic widescreen, while the other three are 1.33:1 (original aspect ratio). 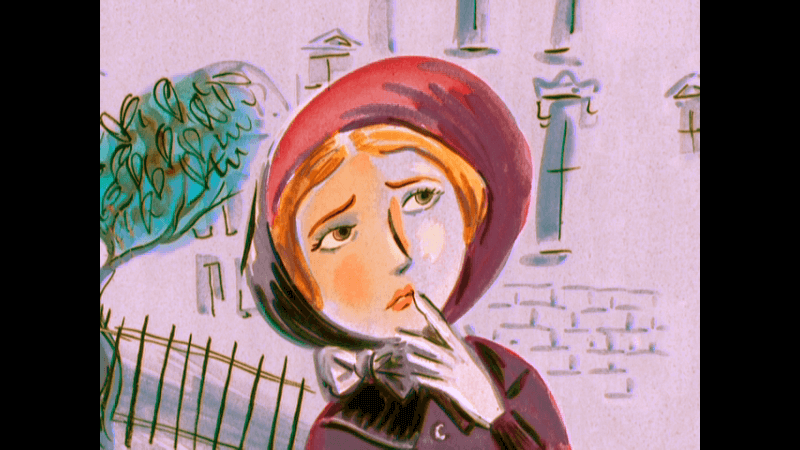 Me...Jane looks great, with evenly-saturated pastel colors and clean lines that preserve its simply animated roots. Not surprisingly, the 1.33:1 shorts are lacking in direct comparison with a softer appearance, occasional interlacing, and less vibrant colors, mostly due to age and the fact that they're sourced from what appears to be videotaped masters. Overall, though, these are fine for what they are, and I'd imagine that anyone familiar with Scholastic's DVD collections will know what to expect. The audio is a bit more clear-cut: all four episodes are presented in Dolby Digital 2.0 and sound fine under the circumstances, with clean narration and music cues that don't fight for attention. There's even some depth at times, creating a relaxed and pleasing atmosphere that's much less obnoxious than traditional kid's programming. Optional read-along (karaoke style) subtitles are included with each short, which is always a welcome touch. Seen above, the basic interface is bland but easy to navigate, with a short intro and a few logos beforehand. All four shorts are presented without chapter stops and, not surprisingly, no layer change was detected during playback. This one-disc release is housed in a black keepcase with a promotional insert for other Scholastic titles. 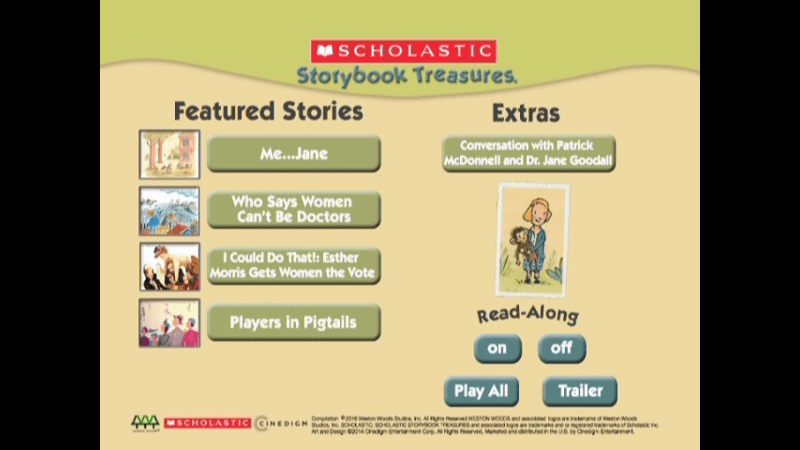 Scholastic DVDs rarely come with extras---outside of "bonus stories", which don't really count----but this one also includes a pleasant Interview with anthropologist Jane Goodall and cartoonist Patrick McDonnell (15 minutes, seen above), author and illustrator of Me...Jane. 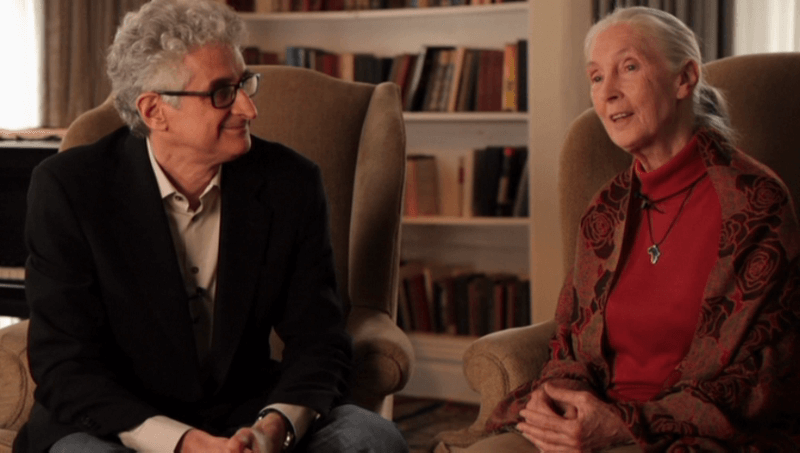 This is obviously a bonus feature that's aimed more at older kids and adults than younger folks, but that's fine: these two contributors offer a relaxed and laid-back conversation that includes Jane's life experiences, Patrick's character designs, and working together on the book. Me...Jane is a thoughtful collection of "girl power" stories that can be enjoyed by all kids, featuring four like-minded animated adaptations of Scholastic books that shed some light on well-known and more obscure female pioneers throughout history. That said, this DVD is extremely thin on content---less than an hour total, even counting the bonus interview---and the "animation" on most of these is little more than subtle panning over still images. Even with the celebrity narration, tasteful music, sound effects, and optional read-along subtitles, most kids would learn just as much by checking out one or more of the original books out from their local library. Rent It if you're really interested in the subject matter, or just buy one of Scholastic's more substantial boxed sets instead.